On Monday 23rd January we screened our new supported Living film at Hollyfield House; over 60 people joined us over the course of the morning. 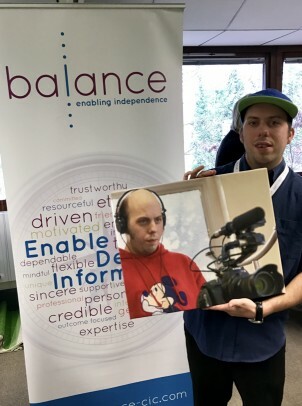 The ten minute film showcases the support Balance can provide and how we work towards individuals outcomes. The idea to make a film came about from Greg Rata. He emailed our suggestion inbox and our CEO Andrea responded to Greg agreeing that this was a good idea. Leeni (Greg’s support worker at the time) worked closely with the film maker, Nurhak Nkarayol. Greg is interested in film making and he was keen to co-produce the film from the beginning, Greg was involved in every aspect of the filming, including setting up the lighting, sound and supporting the people being filmed/interviewed. Greg says he ‘enjoyed the experience, and learnt a lot about filming’. As a thank you for his hard work Greg was presented with a canvas picture of himself during filming. Thank you for everyone who featured in the film and gave their time, without you it would not have been possible.